A Novel for Fans of Manga and Kdrama! I really did not expect to like Ink. Obviously, I did when I requested the book (Japan! Fantasy! That cover! ), but reviews started pouring in and almost all were negative and listed the sorts of reasons I generally agree with, like relationship dynamics and instalove. Here I am, though, having really liked Ink, almost loved it, in spite of all of that. While I can see why a lot of my trusted friends haven't enjoyed it, I had a ton of fun reading it and, minus some hiccups on the romance side of things, thought it was a strong novel besides. Ink turned out to be a fantastic book, despite my expectations to the contrary. If book two were available now, I would not hesitate to read it right away. I highly recommend this one to fans of Japanese or Korean pop culture! I went into this one thinking I was going to love it but I found it kinda flat. For me the romance was a bit flat and the story dragged a bit. The premise is really intriguing but I just think it could have been carried off at a faster pace. This book took me a month to read and that's a long time for me. The stuff about Japan was good though and I do feel like the author really captured Japan well. I felt like I was there. I'd consider picking up the next in the series to see if it picks up for me. I think this read was less about the book not being good and maybe more about it just not being a good fit for me. I tend to read thrillers so I got caught by the slower pacing in this one. 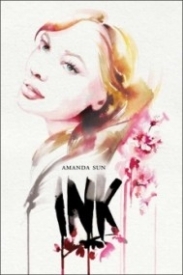 In an industry where almost all the top YA novels are set in US or somewhere like Europe (even those are rare), Ink is fresh and exotic with its Japanese setting. I honestly was intrigued because for the first time, I was reading a YA book set in Japan with the paranormal legends from Japan. Having read plenty of manga and light novels, I honestly can say the writing was in sync with the setting. It had a distinctive style and the even the cultural nuances were so on the mark – the behavior of the characters, how they speak to each other, and other details like the day-to-day things that Katie does. The realistic storytelling completely drew me in, and the darker tones to the story intrigued me. Katie is such a strong girl; fearless and doesn’t back down from a challenge. Few would actually have the courage to go to an entirely foreign country where you don’t even know the language properly. Japanese is a tough language and reading it is particularly a challenge. Even conversations have these little rules, differences for a single statement based on who you were talking to. She braves it, though stumbling along the way, while fitting into a traditional school. Tomohiro, a loner, who is used to pushing people away for their safety, is quite complex and layered. He believes he is less than human, and the Kami within him is bursting to take over. Katie unbalances him, surprises him with her pushiness and borderline stalker-like tendencies. He does have his low moments (especially when he is trying to ‘protect’) – for which Katie calls him out on, overall he is a good guy. The dynamic between them is so cute – with the banter and snarkiness. Perhaps if you are not used to any Japanese works, it might seem a bit odd at times – with how much emphasis they put on names. The mythology was interesting, with the Kami being spirits passed along a bloodline that can control ink and make it create and do their bidding. I am definitely hoping for more details, though – especially about the dreams Tomohiro had in Shadows, the prequel. Katie being present in his dreams seemed quite a crucial thing which never came up in Ink, so I was a bit disappointed when that wasn’t explained. Basically, a great read if you are into Japanese legends or are looking for something new in the paranormal genre. When I read Shadows by Sun, I just knew that I was going to love this. Unfortunately I did not. I thought I was going to learn so much about Japanese mythology but most of my questions went unanswered in the end. What I most disliked about the book, was the first third of it. It was a bit confusing and the switching of Japanese and English and back and forth was weird for me. I felt like it needed a smoother transition. Then, the biggest drama filled thing that I remember from the first part of the book was what happened between Myu and Tomo, and after that I was a little disappointed. What I did enjoy was the romance. We all know I love me some swoony scenes, and this one definitely has some. I loved the way that Tomo and Katie interacted together. Well once they gave in and stopped avoiding each other. All in all, I'm not a huge fan of books that take a long time to get going, so I was a little disappointed when this one did. I wanted so bad to love it, but I just couldn't get into it. Then, as I reached the end, there were still some things I did not understand. I just couldn't get into it like I wanted.